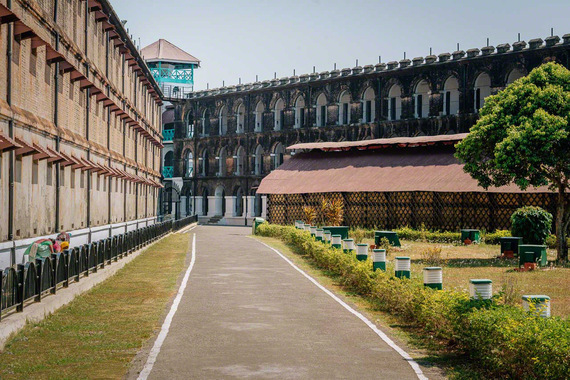 Prisoners on the upper levels of the Cellular Jail, if their wings faced Ross Island, should've been able to see that pearl of a place the British had made for themselves. Bangalorean. Manufacturer of Aerospace and Defense Components and Systems, supplying to customers in Europe and USA. Prisoners on the upper levels of the Cellular Jail, if their wings faced Ross Island, should've been able to see that pearl of a place the British had made for themselves. It was something the colonisers rewarded themselves with, posted as they were to a frontier post in which a major task was to administrate the dread prison of the jewel in their crown and, of course, to provide safe harbour to passing friendly vessels. At night the condemned men should've watched the lights on the island across waters black in the dark, a mere ten minutes away by boat. Kala pani. Black waters. By day the waters in this vast bay are a brilliant green upon deep blue. Sometimes they're green everywhere. Their uplifting sight is a sure cure for the depressed who've arrived of their own will. But for those condemned to these small islands a thousand watery miles out from home, the waters would've offered no colour and no hope any time. The Jail Museum (and the daily sound and light show) pin most attention on one jailor: David Barrie, an Irishman, who was in charge from 1905 until 1919. He welcomed every fresh boatload of men in person, and challenged them to answer why the prison walls were so low. "Because there's the sea on all sides for a thousand miles. So listen! Here on this island I'm your God." The jail is on a rise on the tip of the island. Its design is clever: the seven wings of it branch out from a central hub like bicycle spokes. Their lengths are unequal, because they terminate on a polygonal perimeter. Each wing faces the back of the wing in front, pushing the prisoner to complete desolation. Savarkar was among the big ones that did time in the Andamans. Ten years, from 1911 until 1921. His cell is on the second floor of an inland-facing wing. 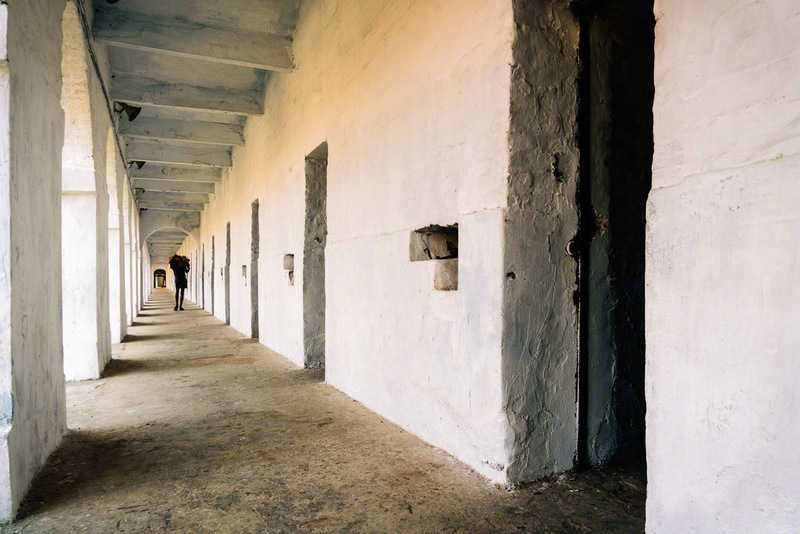 Down below and across from his cell were the gallows where three men could be released from the misery of Kala Pani with one tug on the lever. Savarkar writes that the sounds of the bulbul bird eased his loneliness. In his cell a hundred years after him, I heard busy sparrows, and a heavy quiet. On Ross Island the English had engineered the elegant life they put together anywhere they went. There's now only the palimpsest of what they'd built in their time, because time and the elements and the roots of tall trees have crushed the structures. Only the façade and the back wall of a fine Presbyterian church stand now, and they're waiting to fall also. A short walk from there on the same height is the plinth of the Commissioner's bungalow with a few walls gripped by trees. On some stretches on the floor some tiles live with their patterns intact. They're a fine pattern, tiles for an exalted man. It's such a small island. But it held everything: a press; a bakery that turned out stuff French style; barracks; lighthouse; tennis courts, swimming pool; a clubhouse for junior commissioned officers; a club house for pukka officers; a market; large bungalows for whites; sequestered dwellings for Indians. Some Tourism Department boards claim Ross Island was then the Paris of the East. If that was so, then it must've been Paris in Miniature. When the Japs occupied the islands during World War II, they broke down the buildings for bricks with which to build bunkers and shelters, rendering waste plentiful Italian marbles and tiles, elaborate painted glasses in the church, and all such lovingly obtained stuff with which the Britons had built their Little Paris. Only the bakery and a portion of the barracks are restored on this island. The sound n' light show uses the façade of the bakery to cast visuals. For me, this show is better conceived and executed than the one at the Cellular Jail. Only, the Ross Island version is graphic, and the hangings and an assassination, as they're shown, are not for children to see. There were over a dozen kids in the audience with me. The poet Gulzar has written the show and narrated the Hindi version. Actor Shabana Azmi had done the English version. It's an emotional affair. It intends to rouse. And the Indian who's been in the Cellular Jail is raw enough for the rousing.